Each player is trying to complete bike routes around town to win Community Awards Points. 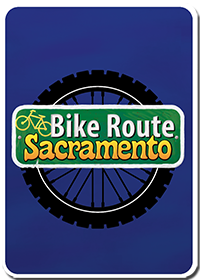 Players will get Bike Route cards that tell which routes the bikers want. Each route is worth 1, 2 or 3 points as shown on the upper left hand corner. The First player to reach 7 Community Awards Points wins the game. worth 2 points when complete. Find the yellow reference cards and give one to each player. Shuffle the entire deck of Route Cards and deal 2 to each player face down. Players may look at their cards but they should keep them a secret. Place all the pawns in the draw bag. Each player takes 2 pawns out of the bag without looking. The player who most recently rode their bike goes first. 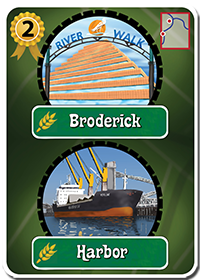 Deal 2 Route cards to each player. On your turn you may take 1 of the following 4 actions. Draw 1 New Bike Route Card. Draw a Bike Route card from the draw pile. You may only every have 5 cards in your hand. Play 2 pawns from your hand onto the map. Each pawn must match the color of the space you place it on. You may play any color pawn on a wild space. Randomly draw 2 pawns from the bag without looking. Discard any number of pawns from the bag and draw the same numbers. You may find that you do not have the right colored pawns in your hand. 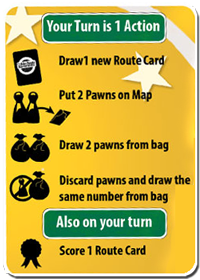 To fix this you can discard any or all of your pawns and draw the exact same number from the bag. Example: You discard 5 pawns to the bag and draw 5 new ones. Each turn you may score 1 Route Card. You score a route card when the route between the 2 locations are connected by complete routes that have pawns on them. To score the card announce the locations and show how they are connected on the map. You may only score 1 route card per turn. If you have 7 or more points in competed route cards you win the game immediately. After you complete your turn the player to your left takes their turn. Every player gets a reference card.